Watford defender Joel Ekstrand has said the "old school Italian" style of former boss Beppe Sannino was not a natural fit for the English club. Sannino quit two weeks ago with the Hornets second in the Championship and was replaced by Oscar Garcia. "He worked in a very old school, Italian way. It can be a big contrast to English football," Ekstrand, 25, told BBC Three Counties Radio. "Other than that, he was a great manager for me." Sannino's departure came after he appeared to experience a backlash from players, personified by winger Lloyd Dyer's decision to shout at the manager after scoring in a 2-0 win over Rotherham. 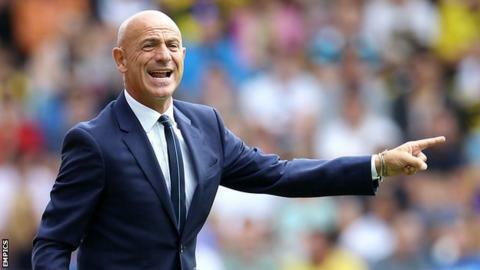 Sannino, who was in charge for eight months after taking over from Gianfranco Zola, has since said the Watford players had "little desire to think about tactics". "With every manager there are always some parts of the squad that are less happy," said Swede Ekstrand. "I can only speak for me personally and I had nothing against Sannino. I had a good time with him. "Zola was very modern and wanted to play with pace and flow, and maybe Sannino was a bit more technical. Managers are not the same - sometimes you succeed, sometimes not." Former Brighton boss Garcia finds himself in the unusual position of taking over a side that are near the top of the table. He takes charge of his first game at Charlton on Saturday, after a week disturbed by international call-ups. "I think it's easier for him to come in now," said Ekstrand. "We are happy to have him here. We have to try and get along as quickly as possible and continue to get as many points as we can. "Little by little he is telling us about his ideas of the game. But he can't come in and change everything - it will be piece by piece."